← That which does not kill you….. The above photo is representative of the scramble my mind has been experiencing all day today. 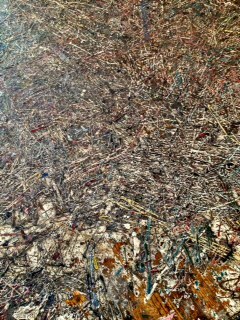 Actually it is the paint-splattered floor from my classroom at Denver Art Students League. Hi. In my absence of the past couple weeks I am sure that issues of vast importance were solved and enormous progress was made with dozens of worldly problems, but in my little domain it was plenty enough that I managed to move to a different residence in the western area outside Denver (at the very base of the bumps that begin the Rocky Mountains) and my book is almost at the printer – thus out of my hands for the first time since it began itself over a year ago. It actually did begin itself, almost without me – I sat down one day with some thoughts that I was intending to call little personal essays. I began writing and one thing led to another – every thought needed expanding upon, every direction I took had to have the back story explained, then pretty soon I was dividing all of it into chapters…no one was more surprised than me. Life sneaks up on us, does it not? Now I am exhausted and beaten up from the physical task of moving, which I did not sit by and just supervise, and mentally from the great challenge of trying to find the best words to use in a 516 page story about the life of a woman artist. Life came at me from both sides – the mental and the physical, with my deep muscle aches and my bruises and my mental so-tired-I-cannot-even-eat-or-sleep fatigue. What was I thinking? Why didn’t I time this better? Two huge things at once. I must be nuts. Then there is the new website – the one about the book – which I was all ready to publish today and proudly guide you to. You would not believe the mess, the 3 hour mess, that a super-human Prince of Patience over in India helped me unravel so that 48 hours from now I might have my lovely new website for the book available to see. It was a marathon of communication he and I had on the phone; I have never experienced anything like it. And while it was in progress the company we were dealing with had a system-wide failure (probably my fault) and we had to repeat the same complicated procedure about 4 times. It was also a lesson in acceptance and faith, (just give it up to the universe) because I was hoping beyond hope that I would somehow manage to be helped by a person I could understand and vice versa – and my experience with him was beyond great. Hurrah for Aman in India!! Wish I knew him better. Perhaps tonight I will sleep more than 4 hours. Perhaps I will not. As soon as the website goes live, or the book is finally published and listed on Amazon.com, you will be the first to know. We are in the final countdown for my novel A CANARY FLIES THE CANYON…. This entry was posted in abstract art, accomplishments, life sneaks up, publishing my book and tagged "A CANARY FLIES THE CANYON", India, my new novel. Bookmark the permalink. Good luck in the new home. ((((((((HUGS))))))) and congratulations! And all is well. This too.